Retired Olympic speedskater Bridie Farrell talks about being sexually abused as a teenager. At left is Sen. Richard Blumenthal. U.S. Sen. Richard Blumenthal, D-Conn., said Wednesday a Senate subcommittee will hold another hearing on abuse in Olympic sports and propose new legislation to tackle the systemic issue occurring under the purview of the U.S. Olympic Committee and national sports organizations. 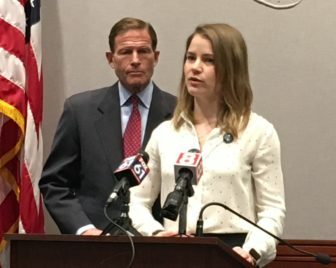 Blumenthal and Connecticut Child Advocate Sarah Eagan stood alongside four former elite athletes as they detailed abuse they experienced in their sports. The senator said the U.S. Olympic Committee, USA Gymnastics, USA Swimming, and other national sports governing bodies have been invited to testify at the upcoming May 22 hearing. “I want to know what they knew, when they knew it, and why they took no action, including the United States Olympic Committee, which also has a trust responsibility,” Blumenthal said. Retired former speedskater Bridie Farrell was a 15-year-old aspiring Olympian when she says her former teammate, Andy Gabel, a prominent Olympic medalist, began sexually abusing her. The former elite speedskater was among a number of top athletes who testified before the Senate Subcommittee on Consumer Protection, Product Safety, Insurance and Data Security’s first hearing in April. That subcommittee has jurisdiction over the Olympic Committee and amateur sports. Farrell described the abuse as “this leash that he had on me that got tighter and tighter,” and said it eventually ended when Gabel left to compete in the 1998 Olympics and then retired from speed skating. The U.S. Center for SafeSport, an independent body that educates and trains top athletes and staff, and investigates reports of sexual misconduct within the U.S. Olympic and Paralympic Movements, opened last March to address abuse in sports. The organization does not have a statute of limitations dictating when people must come forward, and it maintains a public database detailing disciplinary decisions for those involved in misconduct. The organization received 540 total reports across 38 different sports in its first year. Those cases led to 73 lifetime bans. “I think that’s a testament to the need for the center and the importance of the timing given the number of reports,” SafeSport spokesman Daniel Hill said. Hill said the organization is working with other professional and youth sports leagues to make them aware of the database when looking to hire new employees. The athletes described similar so-called grooming tactics by their abusers, including receiving constant individual attention and time together with them. Debra Denithorne Grodensky, a former competitive swimmer, said the grooming process is a form of emotional abuse and serves as a gateway to the sexual abuse.